As a youth, Dr. Ben Carson endured being called a “dummy.” He was a lackadaisical student, tormented by classmates for years, before he made the effort to develop the intellectual curiosity that eventually shaped him as one of the top neurosurgeons of his day. Capitalizing on brainpower — Carson told GCU students, staff and basketball fans — is a path for America out of a dark political time marked by scandalous elected officials, dishonest mainstream media and 93 million citizens who didn’t vote during the last presidential election. Now is the time, he said, for young people to prepare themselves to be part of a solution. 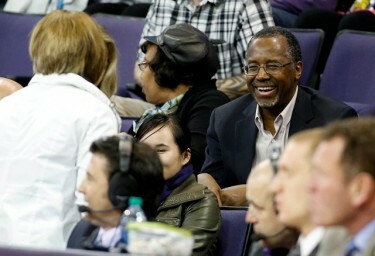 Dr. Ben Carson shared copies of his book, “One Vote: Make Your Voice Heard,” with the GCU Arena crowd Thursday night. Carson spoke at GCU Arena Thursday following the Lopes men’s basketball team’s 78-57 victory over Kansas City. As part of his special appearance, the Arena audience received copies of “One Vote: Make Your Voice Heard,” the latest of several books by The New York Times best-selling author. To a rousing applause, GCU President and CEO Brian Mueller introduced Carson as “a devout Christian who’s become a powerful voice in American politics.” Throughout his intimate 25-minute talk, Carson calmly wove his personal journey and faith into urging that Americans educate themselves on the issues gripping the nation. On Carson’s website, www.realbencarson.com, “One Vote” is described as “an urgent, nonpartisan, and unbiased plea for every American citizen to exercise the power of their vote in every election.” At the Arena, he spoke about the need for fiscal conservatism, a less-intrusive government, smarter use of energy resources and military response against Islamic terrorists who threaten America. The former chief pediatric neurosurgeon at Johns Hopkins Children’s Center is known as the first doctor to separate conjoined twins at the head, in 1987. He lists pediatric neurosurgery and adult trigeminal neuralgia, or severe facial pain, as his primary medical passions. Recently, Carson has emerged as a potential candidate for the GOP presidential nomination, although he has not officially announced his candidacy. The emeritus professor at Johns Hopkins School of Medicine has never held public office. He was appointed by George W. Bush to the President’s Council on Bioethics and received the Presidential Medal of Freedom from Bush in 2008. Carson was born in Detroit to parents who separated during his youth. His father was a Seventh-day Adventist minister. Carson and his older brother grew up in the inner city, though their mother encouraged them to read voraciously and keep their focus on college. Carson earned the high school accolades that enabled him to attend Yale University. He earned a B.S. in Psychology and went on to complete a medical degree from the University of Michigan Medical School. 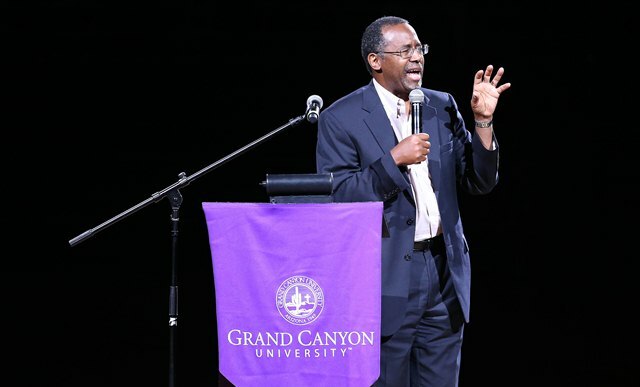 Carson was candidly inspirational about transcending poverty to become a world-renowned neurosurgeon. During the game, Carson sat next to Mueller and Jerry Colangelo, the longtime professional sports executive for whom GCU’s Colangelo College of Business is named. Carson said he was impressed by how GCU was “moving tremendously” toward a future where its graduates can impact their communities. For sophomore communications major Justin Owens, Thursday night was a reunion. Owens, a GCU Learning Lounge student worker who left his native inner-city Baltimore to attend GCU, met briefly with Carson backstage to catch up with the philanthropist who helped him during middle school. Owens received a scholarship through the Carson Scholars Fund, which helped open doors to different schools and work toward going to college. Owens said that Carson’s involvement in the program inspired him to push himself toward a new life in a new city. But he admitted to Carson he was a little homesick for Baltimore. He added that Carson also once operated on Owens’ father’s brain following a serious head injury he suffered during an assault. Back stage after visiting with Carson and his wife, Candy (or “Miss Candy,”as he remembered), the student recalled seeing the imprint of a Timberland boot on his father’s face as he lay in the hospital. He remembered feeling the pull toward college validated by Carson’s path in life. “It reminds me it doesn’t matter where you come from,” Owens said. It’s about what you plan to do with the God-given gifts at your fingertips. Wonderful article! It is a fact that the doctor has helped so very many, both through his vocation and through the Carson Scholar’s Fund, among other things. It’s always heartwarming to witness these reunions where folks have another chance to greet, thank and encourage this man…the bond there is apparently very strong indeed. Dr. Carson has a unique, genuine and wise voice for today’s troubled world, and there are few men who can speak to our problems with such eloquence.